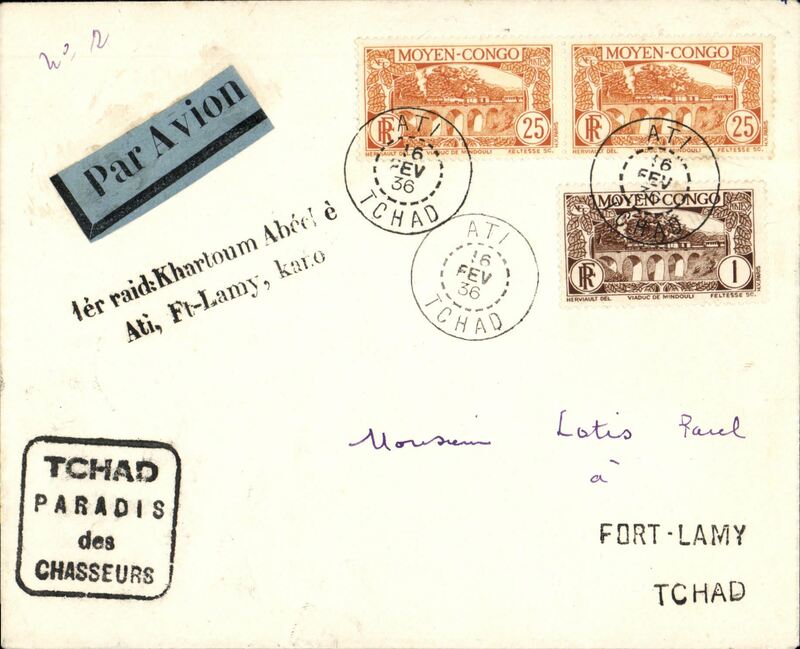 First acceptance for Chad from Austria, Vienna to Fort Lamy, 27/2 arrival ds front and back, plain card carried on the first regular SABENA flight by the aircraft "Edmond Thieffrey" from Brussels to Leopoldville via Marseilles-Oran-Colomb Bechar-Reggan-Gao-Niamey-Zinder-Fort Lamy-Bangui-Coquilhatville, franked Austria 1925 air 10g & 30g, red framed bilingual French/Flemish F/F cachet. Kohl 35.101 A6, only 20 flown. 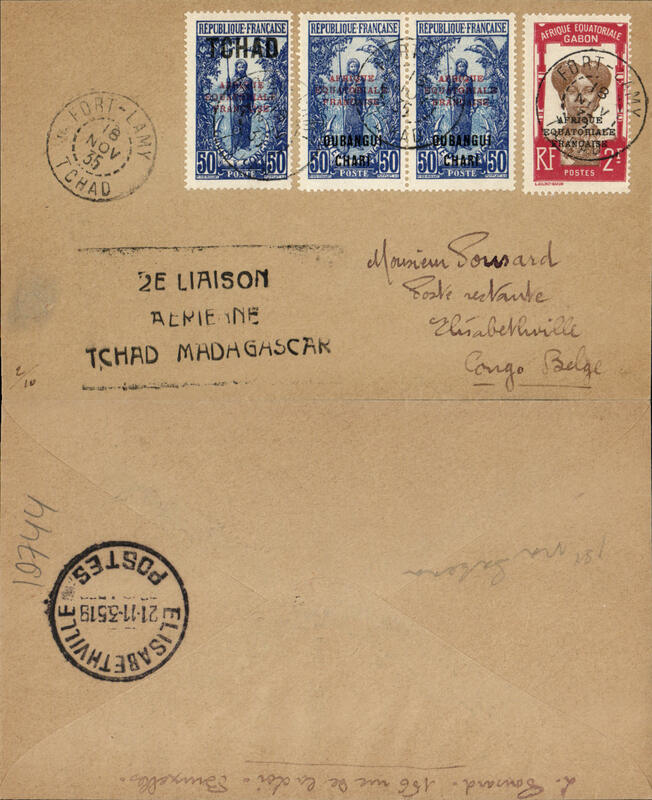 Chad to the Congo, Fort Lamy to Elisabethville, bs 21/1, plain cover franked Chad stamps 3.50F, canc Fort Lamy cds, black "2E Laison/Aerienne/Chad to Madagascar". It is not often that special cachets are prepared for the second flight on a given route. However, given the nature of the joint, pooled service, the second flight was in fact the first by Sabena. That by Air Afrique having passed through one week earlier. Unusual. 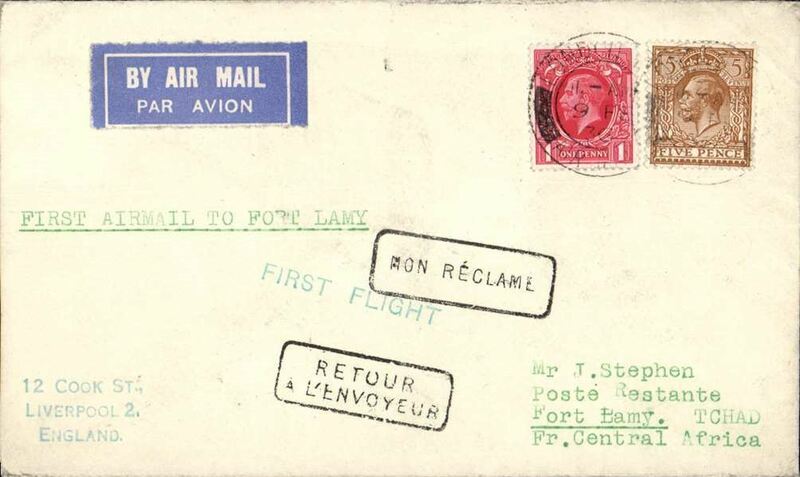 Imperial Airways/Air Afrique, first acceptance for Fort Lamy (Chad), bs 6/2, carried on the inaugural London-Nigeria airmail service, etiquette cover, correctly rated 6d, green 'First Flight' cachet, typed 'First Airmail to Fort Lamy', Imperial Airways. Scarce. 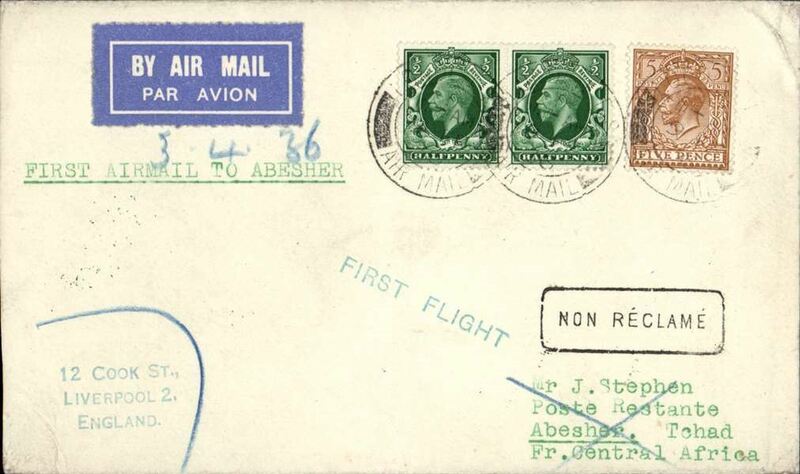 Imperial Airways/Air Afrique, first acceptance for Abesher (Chad), bs 26/2, via Fort Lamy 16/2, carried on the inaugural London-Nigeria airmail service, etiquette cover, correctly rated 6d, green 'First Flight' cachet, typed 'First Airmail to Abesher', Imperial Airways. Scarce. Letters to Abesher were dropped at Fort Lamy until April 10, when they were first dropped at Abesher, see Baldwin #438, p75. 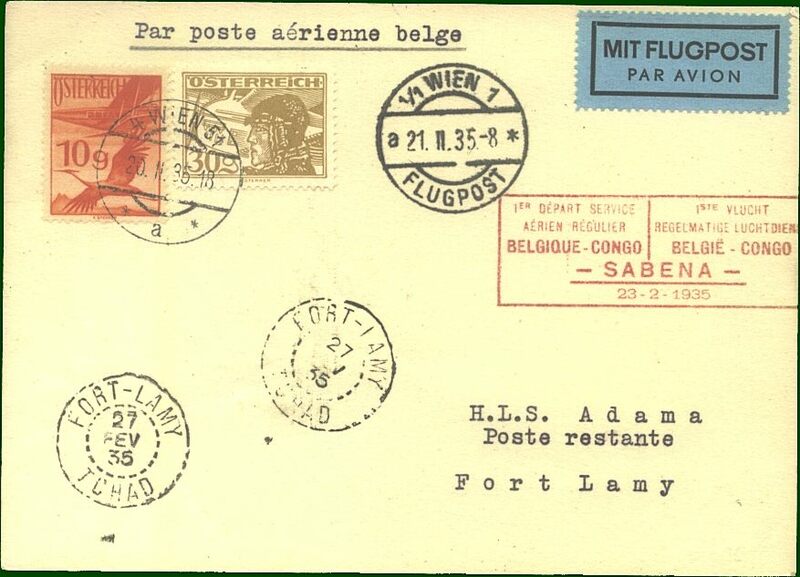 Scarce F/F Ati to Fort Lamy, bs 16/2, carried on the Imperial Airways/Elders Colonial Airways West African Feeder Service to Nigeria, plain cover franked 51F Moyen Congo stamps, canc Ati/Chad cds, black two line '1er raid: Khartoum Abecher, Ati,Ft. Lamy, Kano' cachet. Believed only 20 flown. Francis Field authentication hs verso. 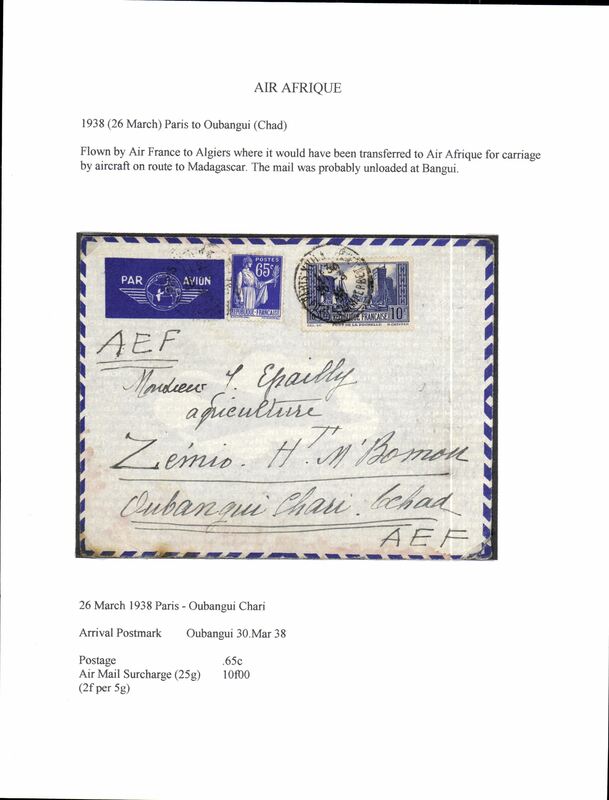 Air France/Air Afrique, into Oubangui (Chad), 30/3 arrival cds, from Paris, airmail etiquette cover correctly rated 65c postage and 10F airmail surcharge (25g & 2F per 5g). Flown by Air France to Algiers then by Air Afrique on route to Madagascar. Written up on exhibition page with nice route, airline carrier and postage rate(s) documentation.